My favourite lip finish, by far, is that juicy, lightly glossy, sheer ‘touch of colour’ finish as I think it’s the sort of look that suits everyone; it instantly lifts the face, giving it light and a pop of light colour that flatters wonderfully. With that in mind, about 90% of my lipsticks that I hold on to are these types of finishes, so I thought I’d put together a list of 14 great choices (to suit all budgets) with varying finishes so you can find your perfect sheer lip colour! 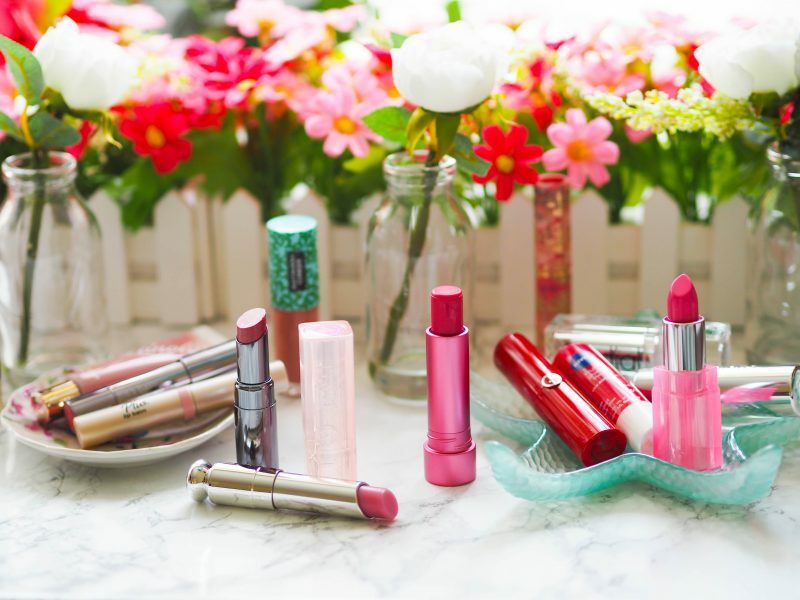 All 14 of these lipsticks are a great choice now we’re starting to see warmer weather (er…sort of) as these work really well with makeup that’s a little more low-key – I always favour sheerer formulas in the Summer months, anything that doesn’t involve too much maintenance is fine by me. 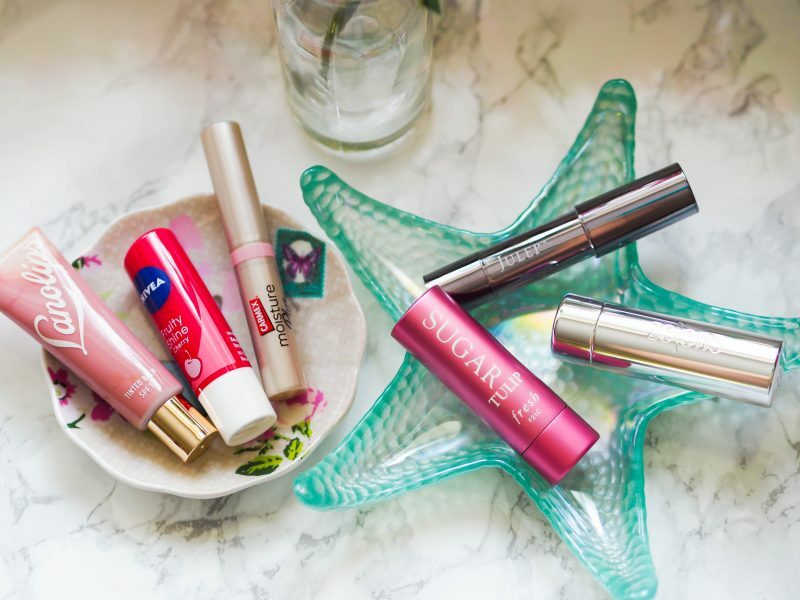 Starting with the lip treatments that have colour, which are your typical tinted lip balm type products. I’ve included the Julep It’s Balm in this list, even though it’s actually one of the most pigmented in this post, because it’s a very nourishing product that feels like a treatment. £14 here – link. Carmex Moisture Plus is a great example of a tinted lip balm that’s purse friendly; it costs less than a fiver and is available in a range of shades, plus it comes in a twist-up lipstick, so no dipping your fingers in messy pots. It’s £4.69 here – link. If it’s a serious bargain you’re after, then the Nivea Fruity Shines will be right up your street! These are also available in a range of colours/flavours, offering the tiniest hint of colour in a pop of fruity balm. They’re a very purse-friendly £2.15 here – link. Would it even count as a post on tinted lip treats if I didn’t include the Fresh Sugar Lip Treatment? 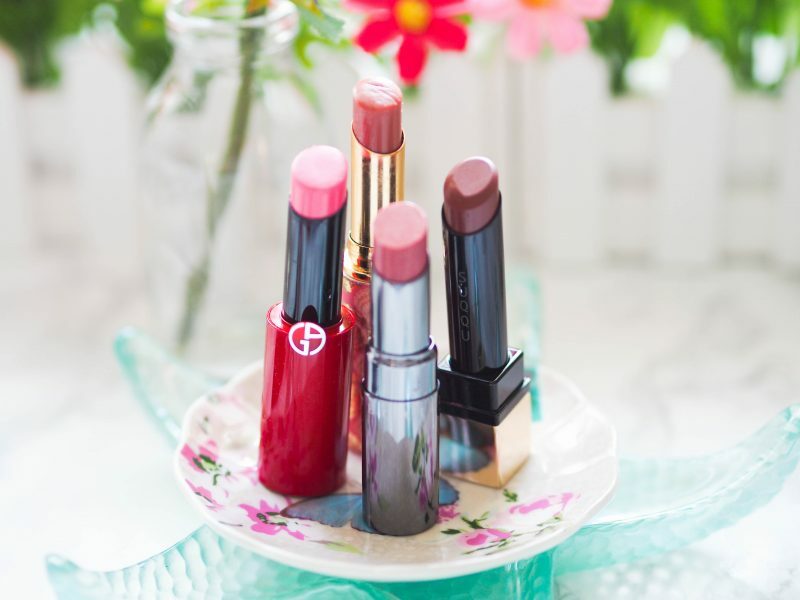 These are truly fancy tinted lip balms that are gorgeous to use and wear, available in a great selection of flattering shades. They’re £19.50 each here – link. Lanolips is one of my most reached for lip treatments (tinted or not) as they are amazing at helping to sooth dry and chapped lips. Ignoring their treatment ability, the colours of the Lanolips Tinted Lip Balms are some of the most flattering shades around, with the Rhubarb shade providing the perfect ‘my lips, but better’ shade. They’re £7.99 here – link. The Zelens Lip Enhancer is pretty much exactly as it sounds, providing a flattering muted gloss finish with a touch of colour that gives lips a lovely enhanced look that’s natural yet very pretty. It’s available in two shades for £32 each here – link. Next up are the products that still provide a lot of hydration, but add more pigment to the lips on a kind of 50/50 split regarding hydration and colour. 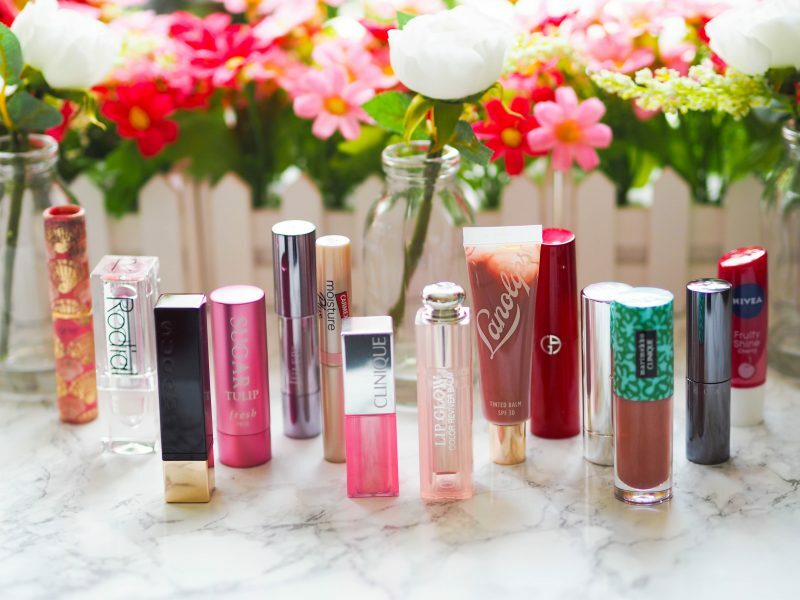 The absolute star of these types of lip products is the Dior Addict Lip Glows, which are just beautiful; creamy, hydrating but subtle, and the colours appear to adjust to your most flattering finish. Expect a more thorough post on these soon, but in the meantime, you can find them for £26 each here – link. Clinique have some great products for this kind of feature, starting with a member of their cult Pop family, the Pop Glaze Sheer Lip Colour and Primer, which is like a more gentle, take on the original Pop lipsticks. These are lightly pigmented, giving lips a wash of sheer, glossy colour. There are six shades and they’re £17 each here – link. The Clinique Pop Splash Lip Gloss and Hydration is as you’d expect, with a pop of gentle colour alongside some serious hydration and a very smooth, glossy finish. These are quite unlike anything else out there, so they’re worth checking out if you fancy something a bit different. They’re available in 11 shades and are £17 each here – link. 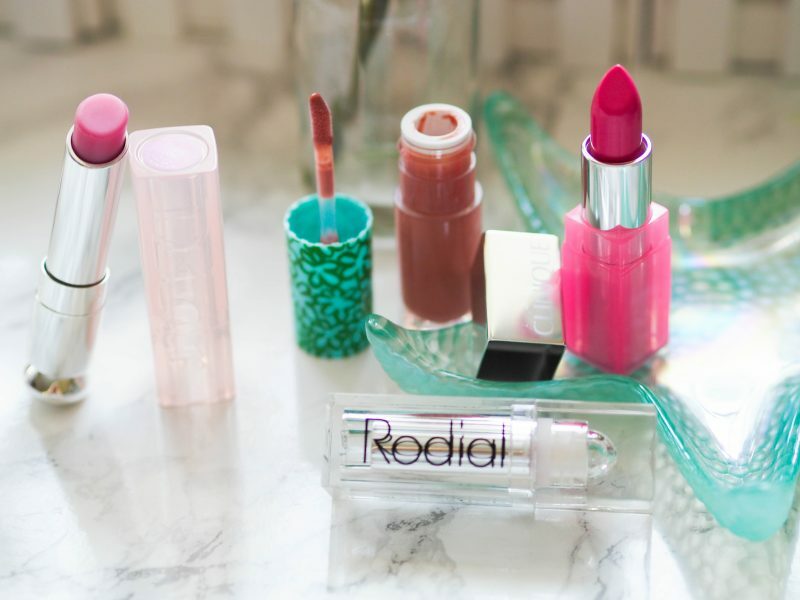 The Rodial Glamsticks were always the product I associated most with the brand, as I spent ages lusting after them! They seem to be phasing them out, which is a bit of a shame as they do lovely colours and I really like the packaging too. You can find a couple of shades left for £12 each – link. The final category focuses on the ones that I think are most lipstick-like, in that they provide quite a bit of colour, whilst still giving lips that hydrated, diffused, slightly glossy finish. One of my favourite launches from last year was the Armani Ecstasy Shine Lipsticks, which are soooo pretty, especially the newer shades that form the Tokyo Garden collection (pictured is the oh-so-gorgeous Sakura pink) which are a true joy to use. They’re £30 here – link. Chantecaille are one of my favourite brands, as pretty much their entire range is all about pretty, sheer and flattering finishes and shades. The Lip Chics are gorgeous, in an amazing shade range which a formula that is buildable and intensely hydrating. They’re £32 here – link. The SUQQU Extra Lip Glow Lipsticks are another that offers a punch of light and and glossy colour in a huge shade range – that’s extended even further thanks to their recent collection launch. They’re £25 here – link. The final product is the tarte Rainforest of the Sea Lip Quench, which provides buildable colour in gorgeous packaging and flattering shades, what more could you want? They’re available in a trio set for £29.52 here – link.